Drive-in movie theaters are pretty much a thing of the past, with very few around and still surviving. 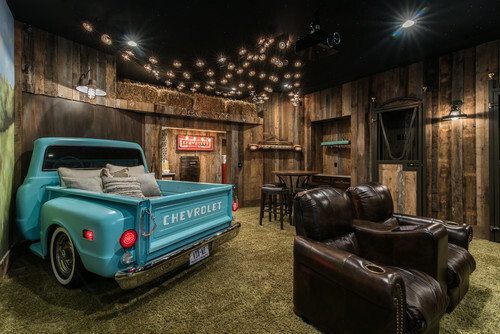 But this creative Charlotte, N.C. mom gave new life to the concept of drive-in movie theaters when she built one in the basement of her own home. Designed by homeowner Tracie Stier-Johnson and Travis Hite of Weber Design Group, this space lets you sink into leather recliners while watching your favorite flick. The reclaimed wood walls make you feel like you're inside a barn. 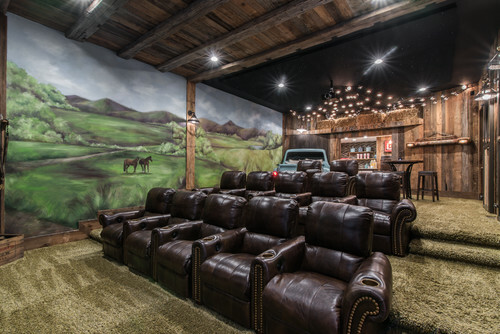 But the shaggy green carpet and the rural horse mural give the basement an outdoorsy vibe. 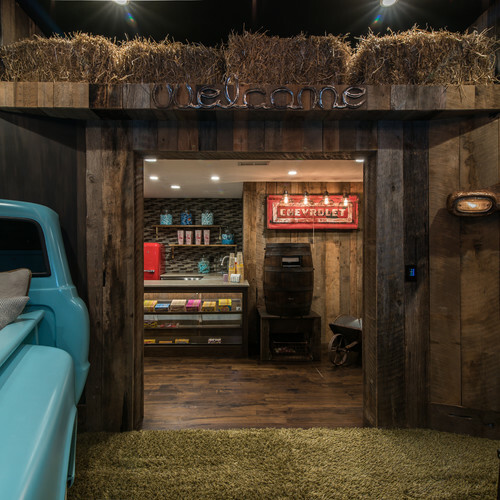 "I wanted the space to feel like it was in a barn, but also like we were outside at a drive-in," Stier-Johnson told Houzz. "The mural looks like the view you'd see from a barn and keeps the room from feeling like a closed-in theater." But the real star of the show is the turquoise Chevy pickup replica. No drive-in movie experience would be complete without a truck bed full of pillows and blankets. Moviegoers can drop down the tailgate, snuggle up in the blankets and gaze up at the starry patio lights overhead. Another must-have barn detail Stier-Johnson incorporated in the design is the hayloft. But what drive-in theater would be complete without a concession stand? 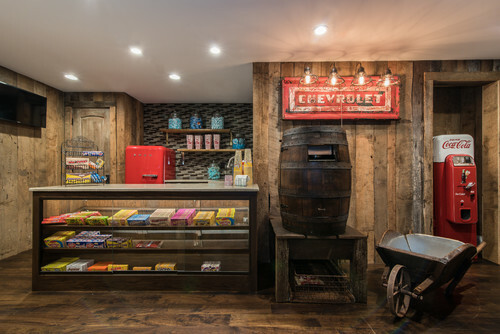 The theater features a fully-stocked snack bar, a vintage Coca-Cola machine, plus a barrel that houses a custom popcorn machine. Perched on a lake just outside of Charlotte, N.C., the rest of the house is equally luxurious. The exquisite master suite features wrap-around windows overlooking a lake. 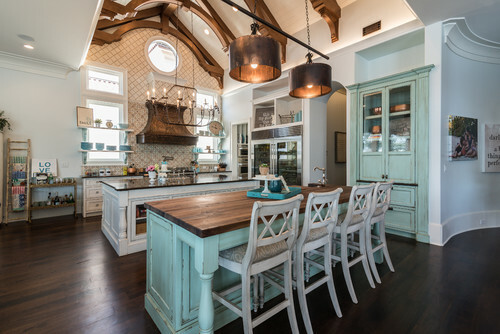 The elaborate kitchen effortlessly blends high-end class with rustic charm. 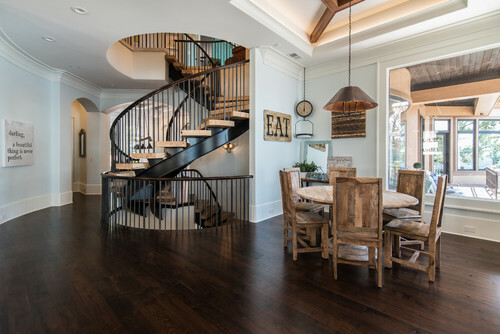 There's even a spiral staircase winding through the house. But if you'd rather not take the stairs, there's also a slide to shoot you from one floor to the next. You can find out more about this unique property here.